At the South Florida law firm of Friedman, Rodman & Frank, our personal injury attorneys use nearly 100 years of combined experience to advocate for those who have been injured in accidents due to the wrongful conduct of others. Since our firm was founded in 1976, we have been committed to securing justice and fair compensation on behalf of our clients. 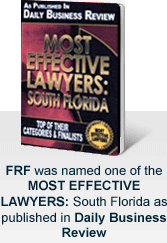 Our Miami car accident lawyers have offices conveniently located in Miami, Homestead, Naples and Miami Beach. We have experience litigating many types personal injury cases, including car accidents, defective products, accidents at sea and abroad, medical malpractice, dangerous workplaces, workers’ compensation, negligent security, and accidents on another's property. Our goal is to secure the maximum amount of compensation possible for the type of injury sustained by our clients, including punitive damages when deserved. We handle all cases on a contingency-fee basis, which means we only get paid when your case reaches a successful resolution. In Florida, as in other states, all motorists owe a duty of reasonable care to other drivers and pedestrians. Any motorist who breaches this duty—whether due to distracted driving, driving under the influence of drugs or alcohol, or any other cause—and injures someone as a result is liable for any injuries and property damage sustained. Florida law requires that every driver carry at least $10,000 in personal injury protection (PIP) coverage, which covers medical costs up to the policy amount in the event of an accident, regardless of fault. Drivers are also required to maintain a minimum of $10,000 in property damage liability (PDL) to cover any damage you or your family members cause (and are liable for) to other people’s property in a car accident. Unfortunately, many Florida drivers do not abide by this law, and even when they do, these minimum amounts can fall far short of adequately compensating injured parties. If you have been involved in a car accident in Miami or elsewhere in South Florida, contact our office to schedule a free consultation with an experienced Miami car accident attorney. If you are injured in a work-related accident, you may be entitled to medical and partial wage replacement benefits under your employer’s workers’ compensation coverage. The Florida workers’ compensation system is designed to allow injured workers to obtain benefits without having to deal with often-cumbersome court proceedings. However, in practice, the workers’ compensation system can be complex and overwhelming to navigate on your own, particularly if you are simultaneously trying to recover from your injuries. Many factors can affect the amount of benefits you receive, such as the assessment of the physician treating you, your responsiveness to the insurance carrier, etc. Moreover, under Florida law, you must report your injury to your employer within 30 days of becoming aware of it; failure to do so can jeopardize your claim for workers’ compensation benefits. In some cases, you might also have a viable claim against a third party, such as a contractor, subcontractor, or manufacturer. If a third party was at least partly responsible for your work accident, you may be able to file a personal injury claim against the third party in addition to your workers’ compensation claim through your employer. Our attorneys will work to identify all sources of compensation for your injuries to maximize your recovery. Florida landowners and those in possession of property have a legal duty toward visitors to the property. Public invitees, business invitees, and licensees by invitation (social invitees) are owed the highest duty. For these visitors, the premises owner must correct or warn of dangers the owner knows or should know of through reasonable care. The owner must also maintain the property in a reasonably safe condition. The duty toward uninvited licensees and trespassers on the property is lower, but still requires that the owner refrain from willful or wanton injury (i.e., remove any concealed traps on the property). If you were injured on another person’s property, you may be entitled to compensation from the landowner. A Miami premises liability lawyer can advise you of your rights under Florida law and help you seek recourse against any responsible parties. Listed in the Martindale-Hubbell Bar Register of Preeminent Lawyers, our accident attorneys possess reputations for professional excellence and the highest levels of skill and integrity. Martindale-Hubbell's peer rating system gives us an AV rating you can use to evaluate our credentials. Our partner belongs to The Million Dollar Advocates Forum, which is an elite legal organization of trial lawyers who have obtained million-dollar outcomes on behalf of their clients. We have the resources of a large firm, but we offer personal attention to all of our clients during the legal process. Our firm is dedicated to making things easier for you. We understand that legal issues can arise at any time and you may need to ask our attorneys questions. Therefore, unlike most law firms, we maintain an open door policy: You may call us at any time day or night to speak directly with an attorney about your concerns. For the same reason, our Miami car accident attorneys are willing to meet with clients at their homes or in hospitals. All our consultations are confidential and free of charge. The personal injury lawyers at our South Florida law offices can speak with you about your concerns in Spanish and Creole in addition to English. We have easily accessible office locations in Miami-Dade, Homestead, Naples, and Miami Beach, and off-street parking at each office. If you or a loved one have been injured by the wrongful conduct of another, contact us toll free at 877-448-8585 or via our online contact form. Sé Habla Español / Nou Parlé Creole.